Robert Spencer looks at free speech and how it is under assault by leftists and Islamacists using public correctness, threats, intimidation and double-standards. Protected under an umbrella that states "you shouldn't offend this group" verbatim quotes from the Quran and the accurately-rendered Muslim names of terror suspects are squashed in an effort to placate the Islamofascists; on campus snowflakes confronted with ideas they disagree with (or simply can't understand) are protected by limiting the dissemination of such ideas to "Free Speech Areas," also known as liberal gulags. 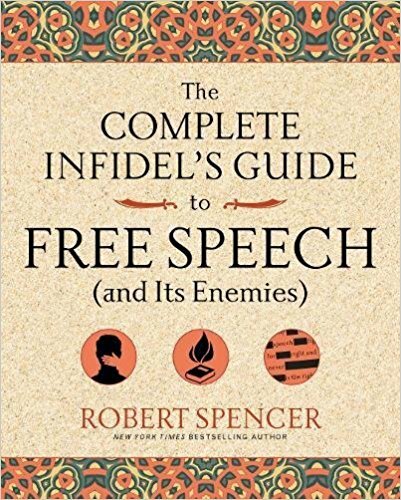 We must wake up and recognize that free speech is a cornerstone of our civilization and Robert Spencer does an excellent job of discussing the importance of such speech. He provides many examples of how free speech has been threatened, everything from threatening emails to the producers of South Park to the murder of the Hebdo Charlie staff. And far from defending free speech, those who should be its greatest proponents (artists, writers, politicians, clergy) are almost desperate in their efforts to excuse those who attack (physically and verbally) those they disagree with but even imply on occasion that "they had it coming." If we lose the power to say "2+2=4" then we truly are lost.